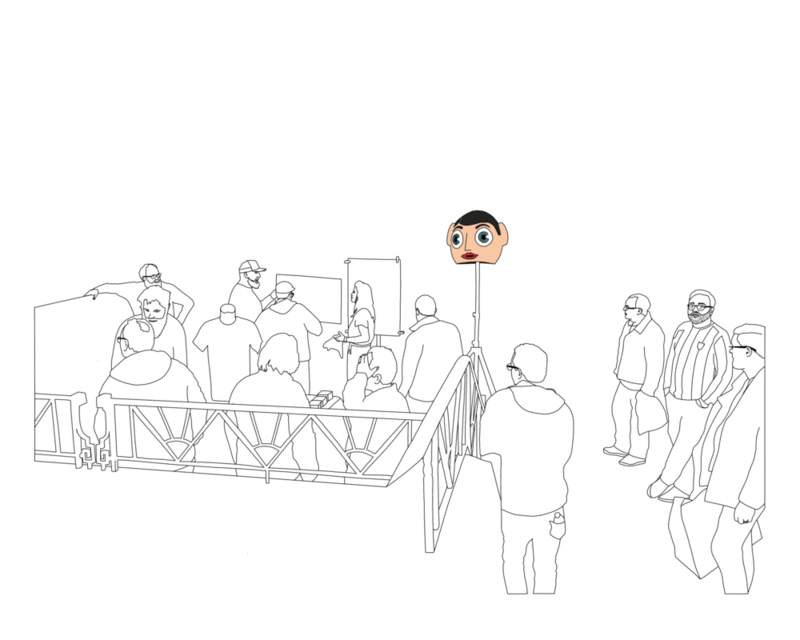 In November of last year, I went to a backers-only screening of ‘Being Frank: The Chris Sievey Documentary’ at The Dancehouse in Manchester. If you’re not from the north of England, you might not know who Chris or Frank are, or perhaps you equate Frank with Michael Fassbender’s disparate version. I was very familiar with Frank - supporting the kickstarter for the documentary on Chris Sievey’s life and ensuring that my name would be listed in the credits was the latest in a long line of Frank Sidebottom related ridiculousness my mum had arranged for me since around 2012 when she took it upon herself to turn my childhood phobia into an adult obsession by finding Frank related ephemera to bombard me with at every birthday, Christmas or ,well, opportunity. 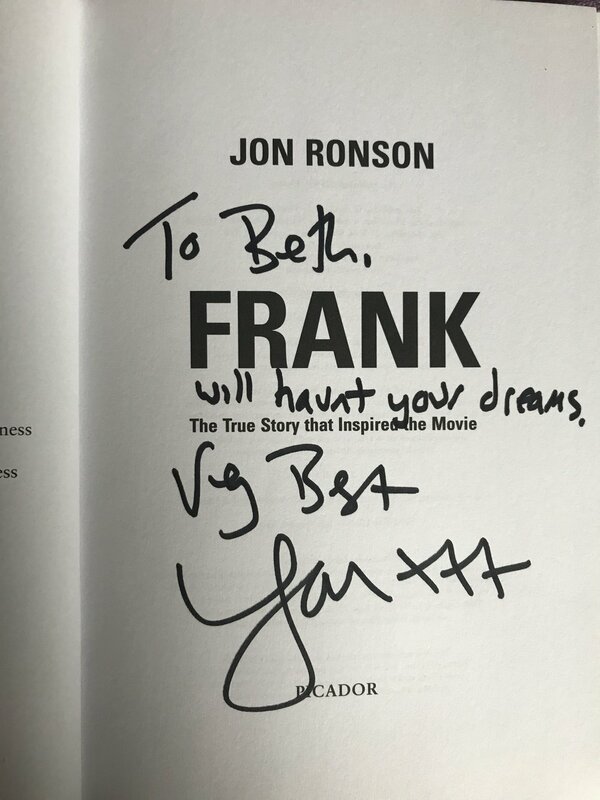 Photos of some of the Frank-related nonsense I’ve endured over the past 7 years appear at the end of this article, but to give you a flavour, my Frank itinerary has included such wonderful ideas as taking me to see Jon Ronson talking about Frank in my hometown of Bury (where his response to me telling him I was terrified of Frank as a child was to sign my book in a most thoughtful way - see below); making felt puppets of Frank and Little Frank, then taking surreptitious photos of everyone I know (and lots of strangers, including a man from Bury market’s workwear stall who donated some hi-vis fabric so Frank could have a small jacket made up and the family in our local Chinese takeaway…) posing with these deliberately bad effigies; and buying me tickets to ‘Frankfest’ - a gig arranged to raise funds for the Frank Sidebottom statue that now proudly stands in Timperley. In 2016, I stood in front of that very statue one calendar month after my 30th birthday as a further ‘surprise’ Frank activity to watch the Manchester Marathon, an opportunity captured lovingly on the mug my mum had made for my Christmas stocking the same year. The slightly deformed felt Frank that she made me the year before even made a candid appearance in a video account of the run filmed by a couple dressed up as, you guessed it, Frank. You get the gist. On this particular November afternoon, it was with a mixture of trepidation, bemusement and curiosity that I found myself in the upstairs bar at The Dancehouse with its art deco curves and linear uplighting. I came to my love of Frank after Chris’s death and felt like somewhat of an interloper amongst his gathered friends and fans. As I made my way inside, I found myself in amongst the collected solo attendees, mainly gathered in awkward silence, supping pints from plastic pots. Some conversations mumbled, the minimal, the nostalgic. A few slightly braver souls were engaging in quiet conversations with strangers of shared anecdotes. ‘What year was that?’ So strong was the general desire to be left alone that one man tucked himself away in a corner reading a book in the semi-darkness of the auditorium. I don’t suppose you can really arrive as a Frankophile without being a bit, well, odd. Frank’s presence was looming large outside the transmission, quite literally. Sometimes ecclesiastically lit in the gloom beside the screen, sometimes a docile sphere disembodied in the foyer, awaiting his cardboard ‘Timperley Big Shorts’ costume. This submissive version impaled atop a post seemed to me the most fitting - Chris’s absence was palpable. His sheer abundance of life and effervescence constrained within the four edges of the screen. But this documentary was not a sad account. For me, it was staggeringly emotional in parts and emotion bookended the event courtesy of Chris’s brother, Martin. First from his storytelling over the footage of Chris’s early life amplifying his clear extraordinariness, and again during the Q&A when he understandably struggled with the loss of Chris’s youngest son, Harrison Stanley Sievey, who appears so full of his father’s remarkable uniqueness in the film. Neither was the director Steve Sullivan’s film always an optimistic portrait. The joy of Chris subverting the norm and making completely unique work strikingly juxtaposed with his inability to pay the phone bill and later bankruptcy. This honesty felt like a factual account rather than a gratuitous put down. The film left me feeling quite emotional - Chris’s idiosyncratic approach to life, the music he was constantly creating, the way people were so accepting of his madness. I’ve been fortunate to see the film twice before its general release across the UK on the 29th March 2019 - in what felt like something my mum had deliberately orchestrated (although she assures me she had nothing to do with it…) there was another preview screening of the film at HOME 2 days before my birthday and so that’s where I celebrated with friends and family, on what the official Frank Sidebottom twitter account declared ‘Frank Sidebottom weekend in the North West’. My brother’s girlfriend even made me this absolutely ridiculous Frank cake. 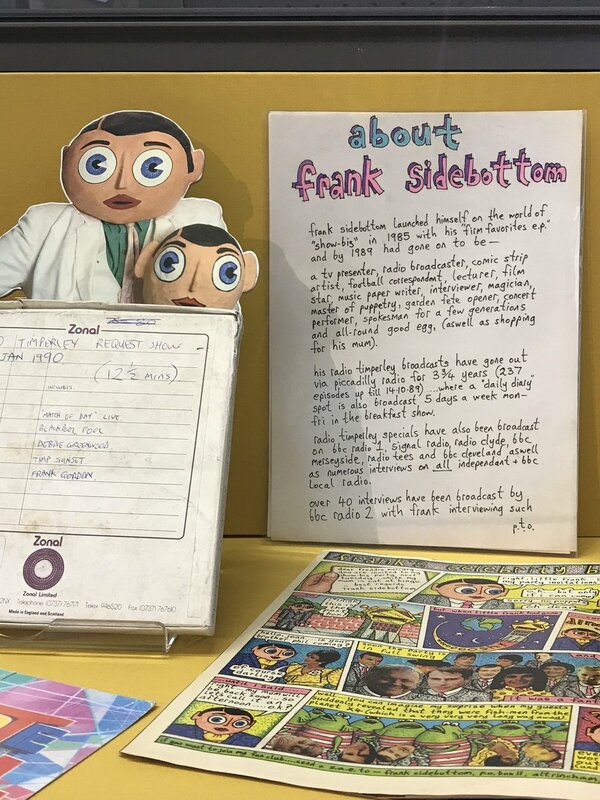 There is no Frank without Chris Sievey, and the message that shines out from the film beyond Chris and The Freshies and even Frank is that you shouldn’t be constrained by anyone else’s ideas or standards or limitations. Go. Create. Be silly. Be bold. ‘Being Frank’ is an enlightening look into the mind of “a man on a mission of rank insanity”, and it’s well worth a trip to the cinema to find out for yourself just how magical Chris was. You know it is, it really is. ‘Bobbins’, the multimedia exhibition about Chris and Frank is on the ground floor of Manchester Central Library until the 30th April 2019.